This sled features a unique curved bow the helps to reduce bow dives when the sled is tethered in swift current. Available in Red or Yellow. The Endurance is fitted with extended tubes which provides its unique design. Floor with anti-slip coating. One end of floor is slightly upturned making it ideal for moving water/towing. Optional: Removable Motor Transom. 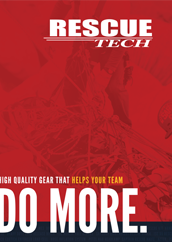 Detachable Motor Transom for Endurance ResQsled allows the user to attach a motor (5 hp max) to the Endurance. 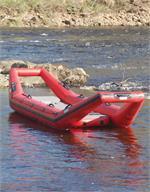 A deluxe set of raft equipment that includes what an existing water rescue team needs for boat operations. Large, Self-Bailing raft for excellent stability.